To boost bottom lines in the long-term, businesses -- whether for-profit or non profit -- need to operate ethically. Ventureneer has joined with Business Ethics to highlight and discuss ethical issues. Businesses, whether for-profit or non profit, cannot succeed in the long term if they don't think long term. If a business is cheating…or destroying the environment, there's going to be a day of reckoning. Setting ethical standards avoids that day. Ethics is an important part of doing well while doing good, so Ventureneer has joined forces with Business Ethics, the Magazine of Corporate Responsibility. A grounding in ethics is essential to the success of social enterprises, socially responsible corporations, and any business -- small or large -- that wants the respect and loyalty of its customers. To highlight the issues -- and the good business reasons for ethical solutions -- Ventureneer will periodically feature postings from Business Ethics and discussions of ethics. Business Ethics was launched as a print magazine in 1987 "to promote ethical business practices, to serve that growing community of professionals and individuals striving to work and invest in responsible ways." It's now an online publication, headed by Michael Connor, an award-winning media executive, entrepreneur, and journalist. He is also executive director of Open-MIC, a non profit organization working to promote a vibrant, diverse media ecosystem through market-based solutions. 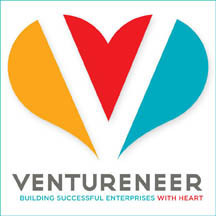 For Ventureneer, this partnership is a logical step in fulfilling its own mission: helping entrepreneurs, social enterprises, and non profits prosper and do well in all aspects of their businesses. "I don't think businesses, whether for-profit or non profit, can succeed in the long term if they don't think long term," says Geri Stengel, founder of Ventureneer. "If a business is cheating its workers, its suppliers, its investors, its customers or destroying the environment, there's going to be a day of reckoning. Setting ethical standards avoids that day." Business Ethics covers a range of topics, from current events, such as Secretary of State Hilary Clinton's call for an open internet, to whether corporate social responsibility has moved from the trendy to a sustainable movement. By working together, Ventureneer and Business Ethics will widen the discussion and awareness of ethics and ethical solutions to business problems.